Keratoconjunctivitis Sicca (KCS) or dry eye, is defined as a chronic disease resulting from inadequate tear production. How will I know if my pet suffers from dry eye? Keratoconjunctivitis Sicca (KCS) is characterized by excessive ocular discharge, squinting, scleral hyperemia (redness of the white part of the eye), corneal pigmentation and ulceration. If you suspect your pet is experiencing dry eye, you should make an appointment with your regular veterinarian for a screening. Once a general practitioner has evaluated your pet, he/she will refer you to a specialist should it be necessary. What causes Keratoconjunctivitis Sicca (KCS)? Some breeds, such as Schnauzer, Bulldog, Chihuahua, and West Highland Terriers are predisposed to develop dry eye,while others are born with the condition. Other causes can be a lack of nerve function, autoimmune disease, chronic infection, medically induced, and surgically induced. How is Keratoconjunctivitis Sicca (KCS) diagnosed? If dry eye is suspected, a schirmer tear test is performed. 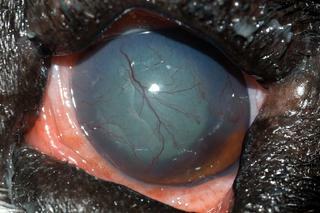 Normal tear production in dogs is 13-21mm/min. In most cases, fluorescein stain is performed to screen for corneal ulceration secondary to dry eye. How is Keratoconjunctivitis Sicca (KCS) treated? In most cases, medical therapy is successful. Surgical intervention is only required once all medical therapy has been exhausted.